Coco background as told to us. Coco was given to the rescue as her owners home had been sold and they could no longer rent it. Coco had lived basically across HWY 101 from the a nice sandy coastal area near Bandon, Oregon. She was a horse they did not want to part with however after finding no alternations the owners asked the Linn County Horse Rescue to help them find a home for Coco. 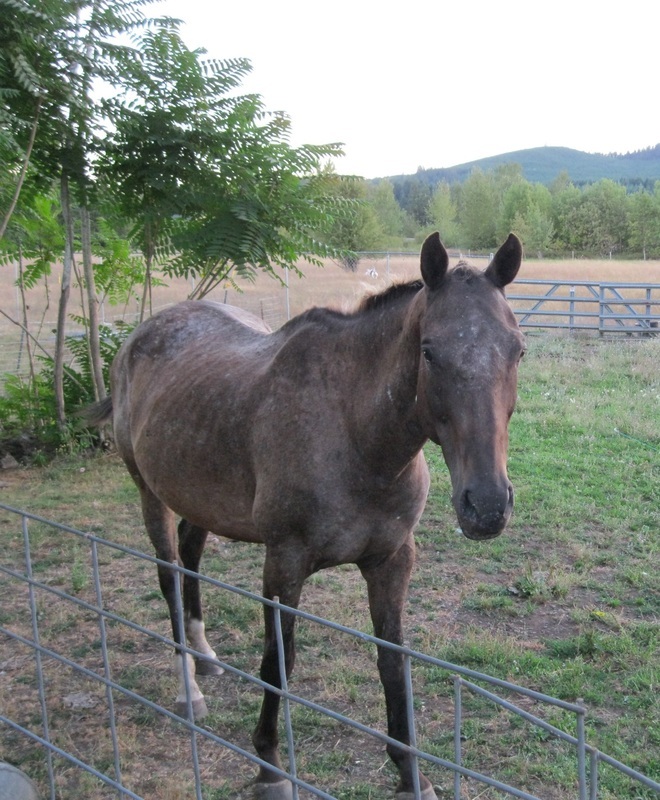 Coco is a 14 yr. old appaloosa mare, standing about 15.5 hands. Coco has been used for trail riding, riding along the coast, and pleasure riding, but she had been around cattle and dogs. We are told she is an easy keeper only having had hay to keep her weight on during the winter she was at the rescue. Coco arrived from the rescue about 100 lbs. less than when we last saw her. We had put our paperwork in and were told by the end of May you should have your horse. The rescue was ran by volunteers which at times did as volunteers do "Oops life get in the way" of what I said I would do. Our paperwork sat on someone's inbox until we called in mid-June asking when our background check and home field visit would occur. That is when the director learned that the home visit and other persons were not following though. The head person can to our home, walked the fields then gave a list of things needing fixing before we could bring Coco to our place. There were some things that were expected, but the 170 fence caps and a roof repair did have to be done prior to her approval to come to our place. We went and visited Coco every few weeks bring her sliced apples and other small treats to help her get to know us. June turned into July then finally second inspection of our place happened the first week of August. More fence caps needed and get a few more things completed. A few more weeks pass as Dan finished summer courses then we went to work on the remaining items on the list. Finally the day arrived for the inspection, we pass, the next morning Coco arrives. Coco arrives at 11 AM Sunday morning, backs out of the trailer with out any issues walks into the small gate finding her field which Dan had made sure still had green grass in it which took loads of watering the corral areas enclosures. 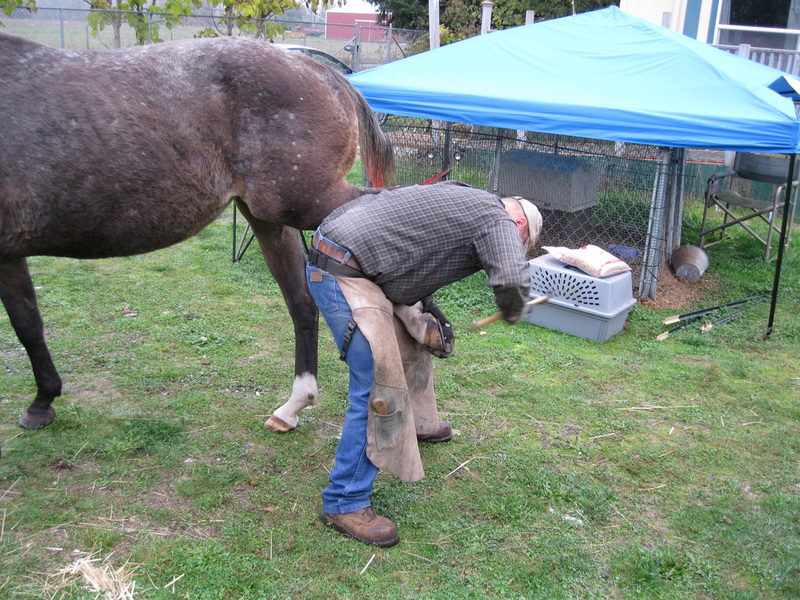 As many of you know we had wintered a stallion so some of the repairs were known, some were a surprise to us. However they were well worth this wonderful horse. She is easy to ride, more bullet proof than I have seen most horses. Coco is not the horse you droll over in pictures, she is the type you bring home as she has all the right goods to make life comfortable type horse. Short main and tail, easy going, happy to be with you, enjoys her feed no matter what we give her, quite, does not mind being touched, stands steady when you lift her feet, gentle, easy to please, and steady. No reall problems we have found yet beyond Coco not liking the swish-swish sound of the fly spray being sprayed on her. Okay so we go get another option thankfully there are other options. She currently is eating all day long you can tell she has already gained weight not having to share the stall with 3 other rescue horses. Coco is not a pushy horse so she took what was left and well those last 3 weeks of sharing the stall rather than being in the field took its toll on her weight. Easy fix as we have 3 tons of nice orchard grass hay we got as a trade for keeping the stallion last winter. Dan and I have put clover, bent grass, fine fescue, timothy, and other grasses into the land each year we have owned this place giving us a wide mix of grasses for the livestock to enjoy. Follow along as we learn to train dogs to not herd horses, to train dogs to herd while we are giving directions from on top of the horse, and to see the ups and downs of horse ownership. I grew up with Quarter horses, my own Shetland pony, and a Morgan plus an appaloosa brought with my first farm. Dan grew up with appaloosas and quarter horses mostly. Dan's dad raised and trained reining horses along with owning a top notch team roping horse along with the horses they had on the farm for trailing the cattle up, down, and around in the summer up in the high mountains of Northern California. Having had a horse here at our place over the winter we are more ready for Coco which is helping the transition for us. It is nice to have the horse to watch out our office as we write this, she is watching me back. She is gaining confidence in us each day even each hour at times. We have read our old books on horses, spent time on the internet researching horses, ordering supplies at the best price, and spent time haunting the feed stores to see what is out there that is workable in our life and not too silly for our tastes. More adventures to follow I am sure. Coco came onto the place summer 2013. She came to use a couple hundred pounds underweight as she had been sharing her stall with other horses and she was bottom on the pecking order. Right you see her the first day she was here, left is about 2 months later still slim but much better than she before. Coco December 2013 see how much more weight she has on her. Coco has grown into the type of horse you could only wish for then she coped an attitude now that she feels all better. Now to adjust that issue a bit. Coco now runs, trots, rolls, and pushes the other livestock around so that they are where she wants them. 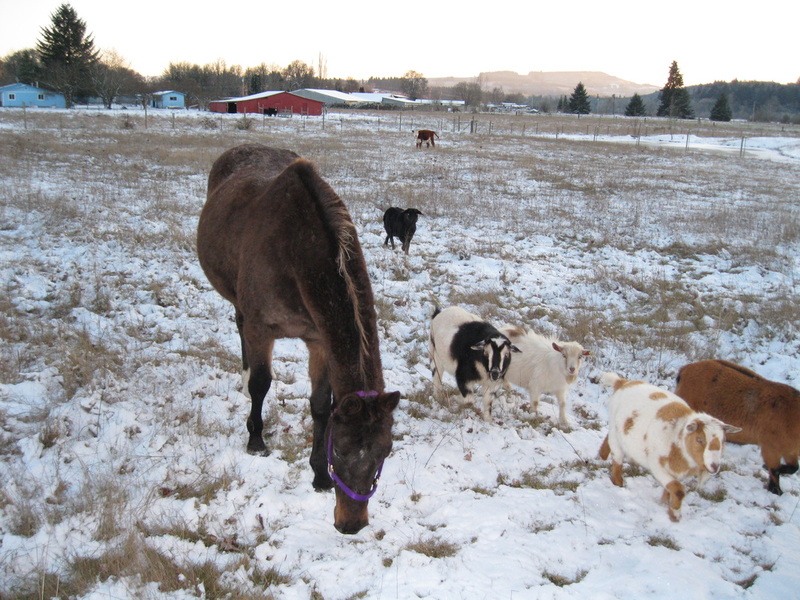 above you can see most of the little pasture critters stayed close to Coco on this chilly day. When it rains hard Coco heads to the Pig Barn the smallest building we have. It is funny to see them all in the pig barn doorway with Coco standing with the goats and sheep all peering out between or around her front legs.